Peter Van Hove, founder of IsoBuster, found himself in a situation with no solution. His favourite Monty Python sketches, as well as other content and streams, were stored on CD-i discs, but couldn’t be played on a Windows PC. A dilemma that needed a resolution! Peter said, “I basically wanted to learn C++ (or any programming for that matter) and I needed a pet project”. He picked up a book called learn how to program C++ in 21 days and took the title to heart. Taking 21 days off work, Peter learned enough to get him started on his first project – a freeware program called ‘Easy CD Menu’. Peter spent a lot of time learning new skills and putting them into practice. After much development, the time came for IsoBuster to be born: “Because the program needed a catchy name, and because the CD-i file-system resembles the ISO9660 file-system, and because it was there to come to people’s rescue… the caped “IsoBuster” came to be”. Cape at the ready, Peter reminisced on IsoBuster’s early days, “I wanted to get access to CD-i discs. Being a Test Engineer with a deep understanding of optical CD formats and drive SCSI commands, it was an almost obvious choice to combine my knowledge with something new, namely programming”. In the early days of IsoBuster, it’s purpose used to be for optical media data recovery (CD, DVD, BD). Peter confirms, “As of version 3.0 it also recovers data from HDDs, USB stick, Diskettes etc.”. We’d be here all day listing out the full features of IsoBuster, so take a look here for the full feature list. IsoBuster is not only a handy tool for the likes of Joe Public, believe it or not, Peter’s creation has been used in the world of Forensics. “Things don’t immediately make sense to somebody only interested in recovering data, but it’s there. Plenty of specialists in the data recovery world and forensics world use IsoBuster”, Peter says. 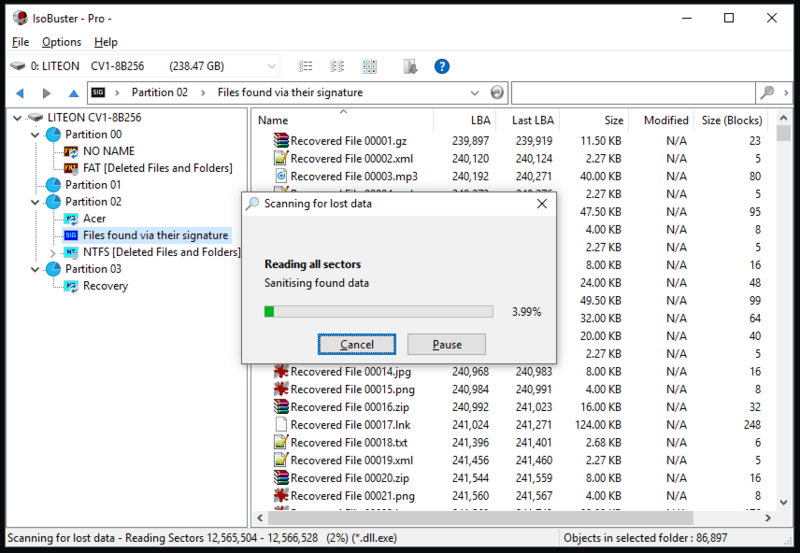 Recovering lost data has never been so easy. It may take time, but we can assure you that it’s well worth it! With the modern world taking over, we’re becoming more reliant on software like IsoBuster in order to be able to recover information from formats that are now out-of-date, like CDs and DVDs. We no longer have to go to the local high street shops in order to buy a video game, we can simply obtain and download a digital copy. Gone are the days of renting a movie on a Friday night, now we have Netflix and Amazon Prime! However, this doesn’t stop the need for recovering information. “There are many such formats, ISO, RMG, IMG, DSK, VHD, VHDX, VMD, etc.”, Peter states. “IsoBuster opens them and shows the track(s)/session(s)/partition(s) and file system(s) with files and folders inside”; thus allowing users to extract them with ease. Considering the technical prowess behind IsoBuster, we were surprised to discover that founder, Peter, runs the show alone. When asked whether Peter had a development team working alongside him, he responded “No, this is just me myself and I”. With similar software rearing its head, we wondered what set IsoBuster apart from the competition. Firstly, being a one-man show, Peter’s software can offer first, second, and third line support immediately. Peter said, “I tend to be easily accessible to anybody and being the sole developer of the software I also know what I’m talking about”. What really triggered a worthy mention here was the fact that Peter not only maintains and upgrades IsoBuster, offering more and more solutions. He also develops software as/when it’s needed for those that require something that IsoBuster doesn’t offer. “I can even develop a solution or fix to something specific in days”. Although a lot of Peter’s hard work has unfortunately been copied, and reinvented in other software, IsoBuster still remains a top player within the market. “IsoBuster has featured many ‘first of a kind’ functionality over the years”, Peter says confidently. “A feature that still stands out is the ability to make ‘managed image files’. IsoBuster keeps track of what was read from the media, and which sectors could not be read”. This means that you can use different drives to complete the managed image file to generate a ‘close as possible’ copy to a disc. With the recent release of IsoBuster 4.1, we asked Peter if he had any plans for the future of IsoBuster. Peter confirmed, “For the time being I have been working on general improvements in files systems, low level reading, corner case situations etc.”. Although no new features are yet on the cards, Peter was keen to ensure that “IsoBuster remains a stable power tool that can deal with all possible situations”. IsoBuster 4.2 is due around June 2018 which may showcase a few new features, but what they’ll be, we’re not able to reveal. We asked Peter if he could shed any light. “By then I will have implemented a few new things. Frankly I don’t know yet what that will be!”. Being able to recover important and ‘lost’ data is priceless. Peter Hove ensures his one-off cost is reasonable for all users. Starting at only $39.95, IsoBuster (in our eyes) is a must-have piece of software. Carefully crafted by the hands of one man, Peter Hove deserves the recognition he has received over the years. IsoBuster is affordable, and that’s how Peter wanted to market the software – allowing it to be accessible by all. We noted that IsoBuster had received over 1.5 million downloads on CNET alone; we were curious if Peter was aware of how popular his software had become. “That is nice to see but only a tiny fraction of the downloads via my own website over the years. That puts things in to perspective!”. Justifiably too, we would say! We have every confidence that Peter will continue to develop and enhance IsoBuster in the future (and beyond). It’s clear to see that IsoBuster’s founder won’t allow technology to pass him by, making every use of it he can, in order to make other’s lives easier.